Metal roofs are popular due to their relatively low cost, minimal maintenance, and longevity. A roof material can last for 40 years or more, sometimes up to 70 years with certain materials. It’s also highly durable, impact resistant, and energy efficient. Of course, like any type of roof, a metal roof does require regular maintenance. Find out how you can properly maintain your metal roof to enjoy it for years, even decades to come. Perform regular inspections: Keep a close watch on your roof to identify distress conditions including movement of panels and fasteners, snow, ice, or hail damage, or sealant failures. You should also look for drains and gutters clogged with debris. Trim trees and bushes away from your roof: Don’t allow trees, bushes, or other objects to rub against your metal roof. Abrasion can cause damage to the finish of a metal roof over months and years of wind motion. Tighten loose screws: If any screws have come loose or have been lost, tighten or replace them. Remember to use the same metal material as the roof to avoid corrosion. Replace sealants and fastener gaskets: Sealants can last up to 20 years, after which they should be replaced. Fastener gaskets should also be replaced at the end of their service lives. 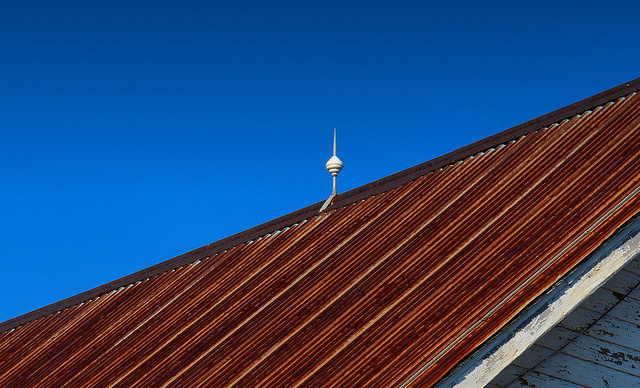 Maintain paint: If any part of your metal roof is painted, be sure to keep paint touched up to avoid inviting rust. Don’t allow debris to accumulate: Use an extendable window cleaning brush to clear debris from valleys in your roof. Allowing debris to gather can lead to corrosion and damage. Clean gutters regularly: Similarly, it’s important to keep your gutters clean and clear. Debris in your gutters can cause corrosion, so be sure to clean them on a regular basis. Remove snow from your roof: Often, snow will slide right off of metal roofs as it begins to melt. However, if you have standing snow, it’s important that you remove it from your roof as soon as possible to avoid rust and corrosion. Minimize foot traffic on your roof: To protect metal roofs, avoid walking on them as much as possible to prevent bending or dishing of sheet metal. If you must walk on your roof, do so directly over joists and purlins while wearing shoes that will not scratch the surface of the roof. Keep different metals separated: Allowing metals of different types to touch each other can lead to corrosion. Repair separated seams: Seams may separate as your meal roof expands with the weather. Be sure to repair holes and seams immediately to avoid leaks and damage to the underlying structure. Seal with a waterproof coating: Don’t allow moisture to cause rust or corrosion buildup. Instead, have your roof sealed with a waterproof rust coating.